2 Introduction In a knowledge-based economy, the competitive advantage is achieved through the capacity of organizations to adapt to the dynamic environment, by generating and applying new knowledge. 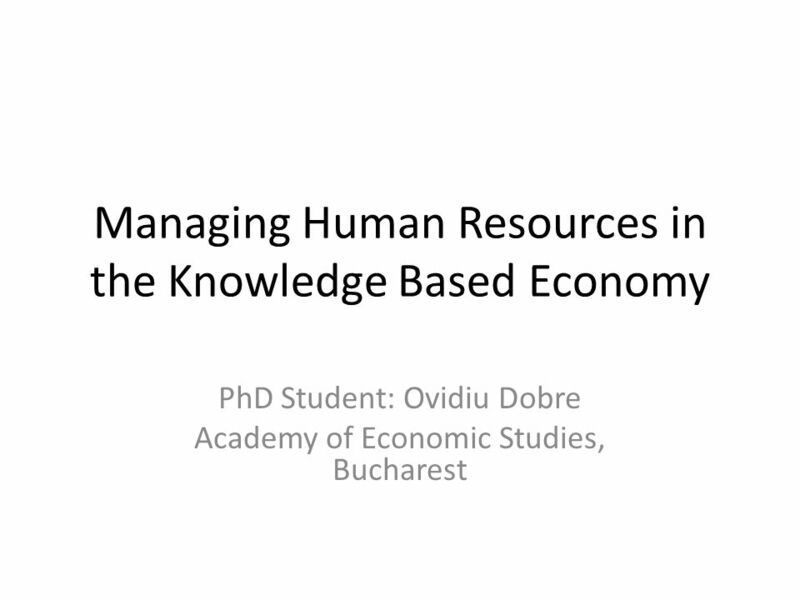 Knowledge economy organizations need human resource development professionals with different competencies and attitudes as compared to traditional environment. Human resources are defined as the accumulated stock of knowledge, skills and abilities possessed by employees, which should be turned into formal expertise by the organization. Organizations and their employees have to acquire new skills and knowledge to satisfy the customers’ needs and compete in today’s dynamic business environment. HRD assumes that organizations can be seen as learning entities and the learning process of organizations and individuals are capable of influence and direction through planned interventions. 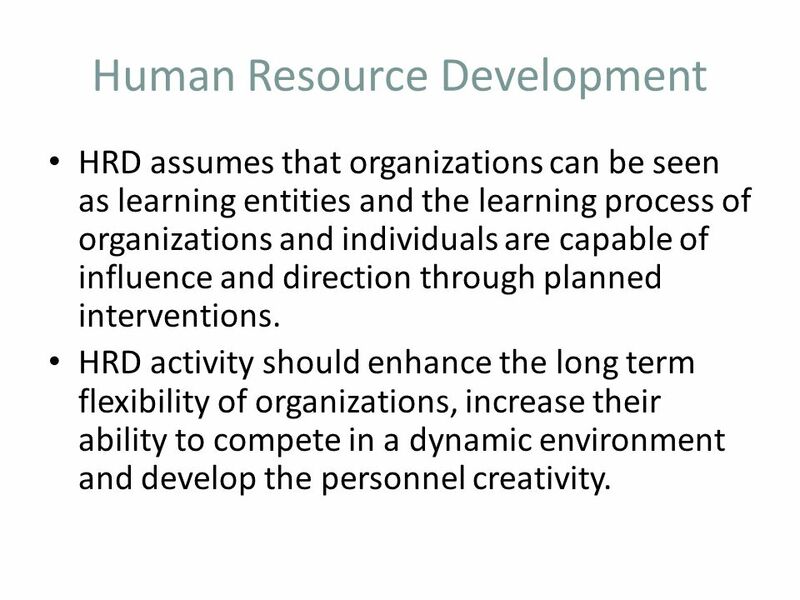 HRD activity should enhance the long term flexibility of organizations, increase their ability to compete in a dynamic environment and develop the personnel creativity. Organizations are a reservoir of knowledge, deeply embodied in the individuals and in the culture that contains the principles encouraging the cooperation and knowledge transfer. The creation of new knowledge is dependent on the existing capabilities of the organizations, as new knowledge is the result of recombination of current expertise. A significant amount of the organization’s knowledge is embodied in the firm’s personnel in the form of tacit knowledge. 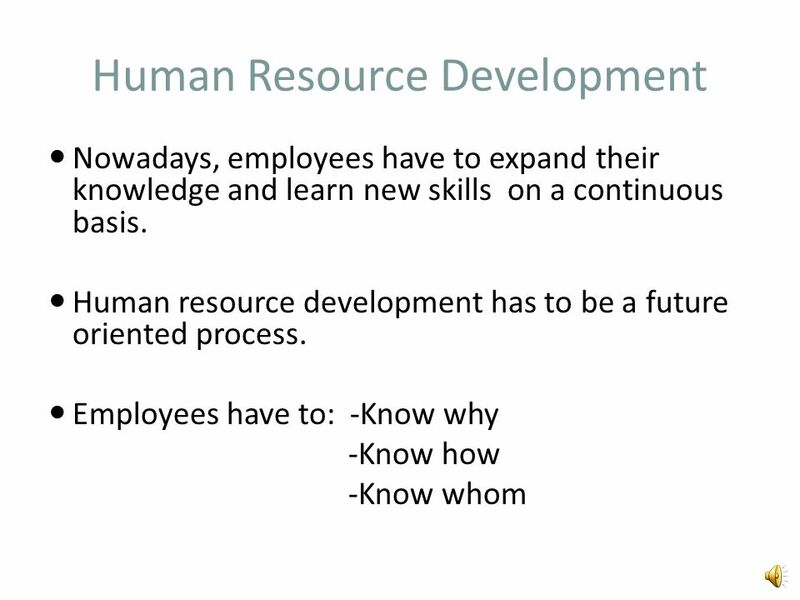 An organization can reduce its dependency on key personnel by implementing a proactive human resource strategy that encourages knowledge transfer and creation. The methods of decision making, training and solving programmed or non programmed problems can either block or foster the knowledge creation process. During the last decades mangers have been interested in implementing an organizational culture which stimulates people to improve their skills and knowledge, by learning continuously. People are the essential component when building a learning organization, as they must be committed to learning and share what they have learned. The organizational environment should facilitate individual and collective learning and develops an environment of trust and openness. 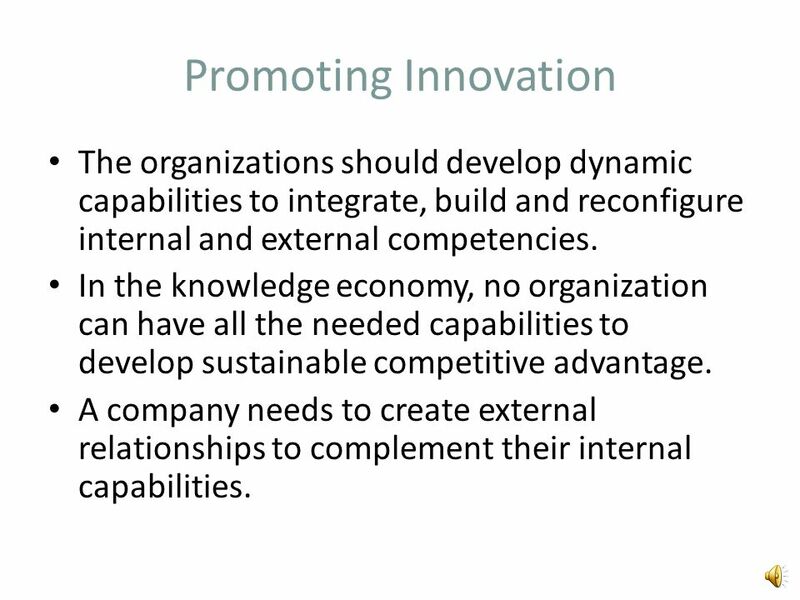 9 Promoting Innovation The organizations should develop dynamic capabilities to integrate, build and reconfigure internal and external competencies. In the knowledge economy, no organization can have all the needed capabilities to develop sustainable competitive advantage. A company needs to create external relationships to complement their internal capabilities. 10 Conclusions Implementing proper HRM strategies require an integrative approach, so that there are aligned horizontally with all human resource processes and vertically with the organizational goals. The relationship between HRM and development has to do more with collaboration, rather than subordination. Organizations competing in a knowledge economy need to create dynamic capabilities continuously, based on continuous learning and knowledge creation. 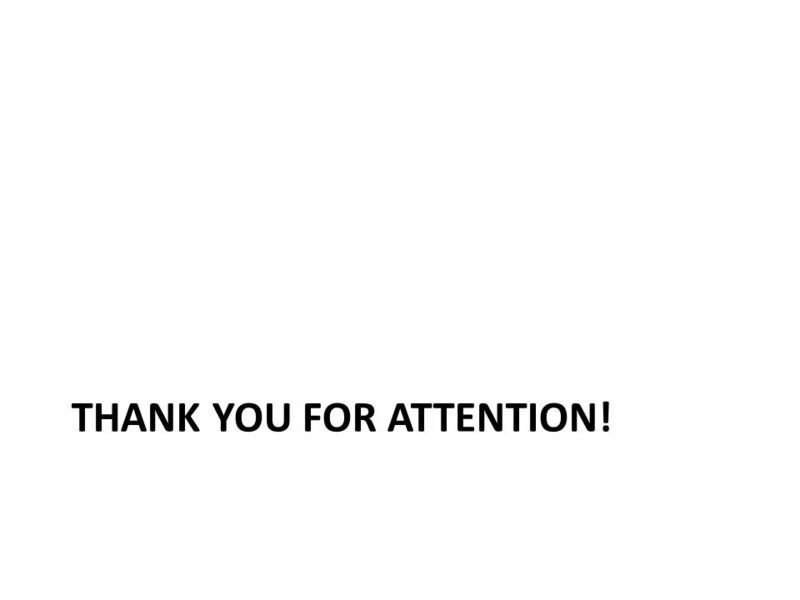 11 Thank you for attention! Download ppt "Managing Human Resources in the Knowledge Based Economy"
Prepared by Management Department | | Internal Innovation : Implementation. What is Strategic HRM? Strategic human resource management: The pattern of planned human resource deployments and activities intended to enable an organization. Competitiveness Intellectual Capital Presented by Vassily K. Dermanov. Chapter 5 Transfer of Training. Copyright © 2002 by The McGraw-Hill Companies, Inc. All rights reserved Chapter Strategic Training. 1 Knowledge Management. 2  Knowledge management (KM) is a process that helps organizations identify, select, organize, disseminate, and transfer important. Creating an organizational learning culture: The perspective of workplace learning Iris Ai-Tzu Li Assistant Professor Graduate Institute of Adult & Continuing. Athens, 14 September 2007 Moving from traditional working methods to a culture of information sharing Luisa Arana Rueda Director - Training and Development. UNDERSTANDING INDIVIDUAL LEVEL FACTORS OF INNOVATION Innovative Behaviors and Learning. Organizational culture and Knowledge management B.V.L.Narayana Sr Professor (T M ) RSC/BRC. Copyright © 2010 Pearson Education, Inc. Publishing as Prentice Hall 1-1 Organizational Theory, Design, and Change Sixth Edition Gareth R. Jones Chapter.